Tyre manufacturer Michelin is supporting the Road Safety Authority (RSA) and its efforts to raise public awareness of the importance of tyre safety. In an analysis by RSA of fatal road accidents occurring in Ireland between 2008 and 2012 just published, defective tyres were identified as the largest single ‘vehicle factor’ involved. 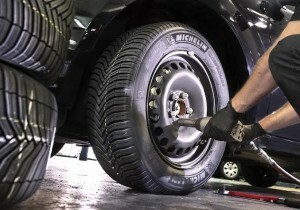 As part of a drive to urge motorists to be extra diligent in ensuring their tyres are properly inflated and maintained, Michelin has been conducting studies at centres throughout the UK and Ireland since 2007 as part of their free Fill-Up-With-Air tyre check programme – which included events held in Galway, Naas, Dungarvan and Ballymena. Having inspected tens of thousands of cars, Michelin found that, on average, 57% of those checked had underinflated tyres, of which 33% were ‘dangerously’ or ‘very dangerously’ under-inflated. In addition, some 5% had a punctured tyre and 1% had tread depths below the legal minimum. Pressures between 8psi and 14psi below the manufacturer’s recommendation are classified as ‘dangerous’ by Michelin, while tyres more than 14psi below the recommended level fall into the ‘very dangerous’ category.